For a while there, it was starting to feel like we already had our summer this year: exactly one weekend of 100F weather about two weeks ago in the midst of a never-ending torrent of cool, grey, windy, rainy days. It’s June, for heaven’s sake! At last it is starting to warm up a little. Anyway, we had a surplus of apples in the house, so in honor of the faux-fall weather, I made some apple dumplings for dessert last week. This is a combination of recipes that works well for me. I generally make the full batch and freeze the extra apples before baking, so we can have apple dumplings on demand for a while. In this instance, I only had time to prep 2 apples before Nolan started fussing, so I refrigerated the dough overnight and used it the next evening for another two apples. It is a soft dough because of the shortening, and didn’t even require warming up to room temperature before I could roll it out. I used gala apples because that’s what we had, and they worked nicely in this context, but I typically use Granny Smiths. I also prefer to serve this with vanilla ice cream, but we didn’t have any. In a food processor, combine the flours, salt and BP. Add the shortening, and pulse until the mixture resembles coarse crumbs; add the milk all at once and pulse just until the dough forms a ball. On a liberally floured surface, roll out the dough into a rectangle about 1/4″ thickness; cut into 6 squares large enough to completely enclose an apple. Preheat the oven to 375F. In a small saucepan over medium high heat, bring the sugar, water, cinnamon and nutmeg to a boil. Remove from the heat, add the butter, and swirl to melt. Pour the sugar syrup over the apples, and bake at 375F for 35 minutes, or until the apples are tender when you insert a knife. As they come out of the oven, spoon the caramelized sugar syrup over the apples’ crusts before it cools. Serve with vanilla ice cream if desired. 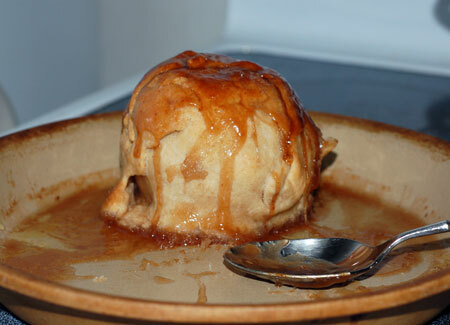 If you froze some of your apples, you can bake them off right from the frozen state. Just remove them from the foil, stick them in a dish and cover them with freshly made sugar syrup, and bake them for a few extra minutes, until the apples are tender. The temperatures are blaring here, but I’ll still gladly eat this! Yum! Holler, this would definitely be an ideal homey dessert to follow soup! Deborah, I’m sure we’ll have the blaring temps ourselves before long, and I’ll be thinking back fondly on all this drizzly gloom. Ah well!